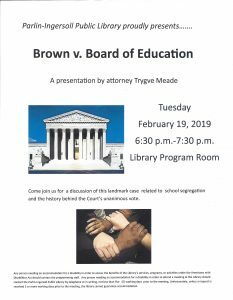 Tuesday, February 19, attorney Trygve Meade will be at the library to present Brown v. Board of Education. Trygve will discuss this landmark case related to school segregation and the history behind the court's unanimous vote. The program starts at 6:30 p.m. in the library program room.